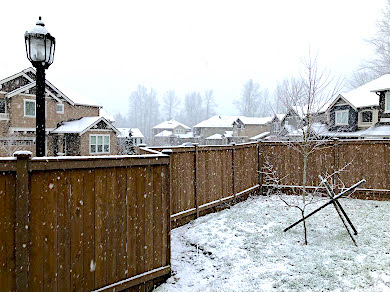 Apologies in advance for this NCR (non-crochet-related) post, but I thought I'd share a bit about the stunning beauty of the Pacific Northwest this snowy season. Being a transplant from California, the frigid winters here have definitely been an adjustment! 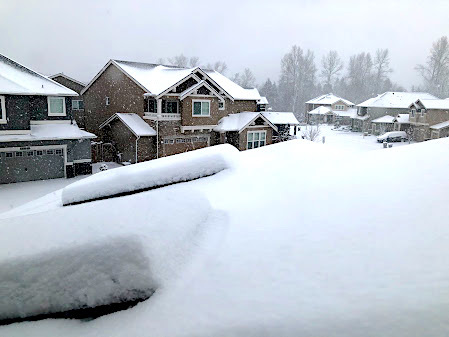 This year, the snow has hit our area pretty hard, as I'm hearing from the Seattleites who've been around for much longer. We're getting 4-10 inches of snow this weekend, and school has been cancelled for two days (with another two days of adjusted schedule) due to the dangerous driving conditions. Aside from the danger, though, it truly is beautiful to admire from within the comfort of being indoors! I'll have to say, every window I look out of right now shows a stunning view of homes and trees blanketed in white. Of course, the little kid in me wouldn't last through this snowy period without romping a bit in the fluffy snow. I got the brilliant idea of making a reverse snow angel, but umm... I got a little more stuck than I had anticipated when I plopped right in. Anyhow, this was just a bit of a tidbit from me, away from the usual crochet-related posts that I make! Hope you enjoyed this tiny slice of my life!